How can Head Start programs prepare children to successfully transition, adapt, and thrive as new Kindergarteners in their new public schools? How can Head Start programs build their own goals with the goals of the receiving schools in mind? Dr. Bergeron’s inspiring speech caused me to reflect on a series of crucial relationships that are at the root of this important transition. Certainly, there is the need to forge relationships between the Head Start program and the receiving schools where their students ultimately go. But there is also the family and their relationship between the two school programs. When you think about it, the family is the constant before, during, and after this transition. I began envisioning a relay race, where a team of educators and caring adults pass the baton along a child’s developmental and educational path and the team “wins” when the child develops into an empathetic, kind, college/career ready young adult. There is not just one caring adult at each critical stage. 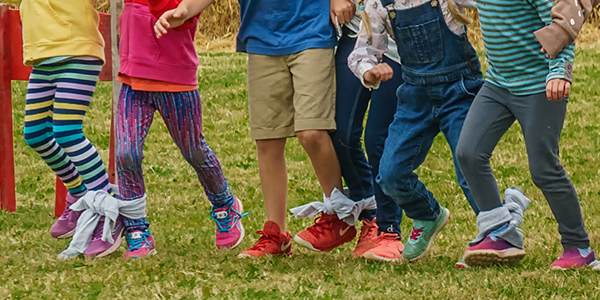 We participate in a three-legged relay race in the goal of developing children, with the family and the educators bound together and working together to run each stage of the relay. What is especially unique about this sport is that the family runs every stage of the race. The family runs with each educator and with each school in the effort to develop their child. Not only that, but families can be the ones who take that baton from the educator’s hand and place it in the next relay racer’s hand, especially when the educators are at two different sites or schools. Many of our Head Start children make the transition from their Head Start program to a public school district, which might be at a different location and is typically managed by a completely different board, standards and guidelines, and educators. In a world impacted by transience, urban and rural geographical challenges, families can be the bridge between early childhood and elementary experiences. Even in the best case scenario where PreK and K programs are communicating, families have something unique to add to the conversation. Families can and must be an essential part of this race if we are to ensure successful transitions and long-term success in a child’s educational career. How can we, as educators, better understand and value this crucial role of families in partnering for the education of their child? How can we empower and inspire families so that they better understand the importance of their role? Imagine families effectively communicating who their child is as a learner. In Head Start, families develop an understanding of their child as a learner as well as their unique strengths and challenges in a formal learning environment. The parents likely partnered with the program to celebrate their child’s accomplishments. They also partnered to provide support and work through any challenges. The strategies that work and the unique history of that child - forming a successful head start for elementary school - can be passed along by the family. Effective communication and real collaboration with families from the beginning can actually save public schools time and energy. Here’s how ReadyRosie is providing modeled experiences so that families have a deep understanding of their children as learners. Imagine families bringing a portfolio of experiences with them when they meet their new Kindergarten teacher. Families are a part of each child’s data story. What if the family came to that new school setting with the historical data of their home learning experiences - a record of what they do to support their child’s learning - so as to demonstrate with data that they are willing and able to partner with their child’s new team of educators. See how ReadyRosie is helping families tell their data story and how their home learning experiences directly ties to their child’s outcomes. Imagine families providing learning over the transition of summer months to prevent summer learning loss. This helps accurately maintain the positive outcomes that have come from their high-quality early childhood experiences and validates the impact of their Head Start/PreK experiences. Here’s how ReadyRosie is helping parents with this and other important transitions. Imagine families’ experiences in Head Start helping revolutionize the K-12 public school system. What if families became the voice that demanded high quality family partnerships? Just like their children, families in Head Start programs are getting a “head start” in what it means to effectively partner with schools in the education of their child. What if families asked to have the same type of partnership they had in Head Start with their public school district? We at ReadyRosie believe this is possible and we will not stop until all families and teachers are running the most effective three legged race possible.